Mango sorbet bellinis are made with just two ingredients, but using sorbet makes them just a little extra special. Top off with a fresh strawberry slice. What’s brunch without a cocktail? Some like Bloody Marys, others love mimosas. Me? Give me a bellini. 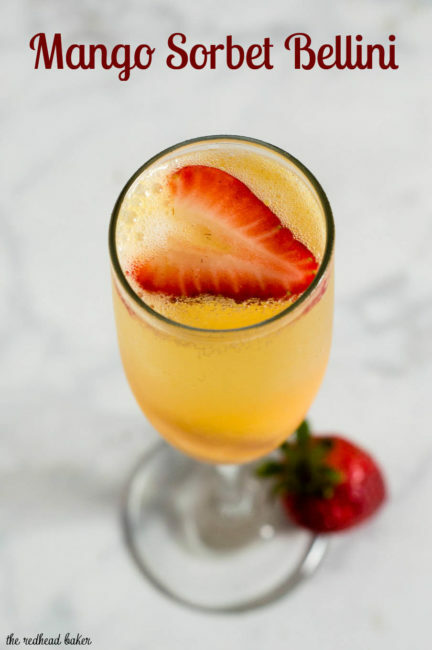 Traditional bellinis are made with peach puree. 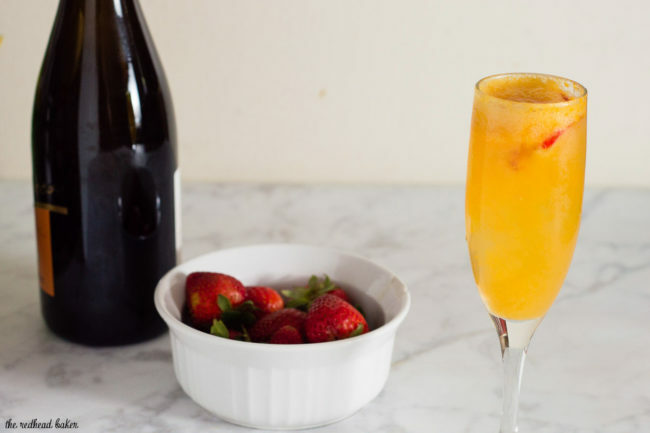 I’ve made bellinis with mango nectar, but that can be somewhat difficult to find in stores. It’s also only sold in a giant bottle, and what do you do with the leftovers? Enter the mango sorbet bellinis. The sorbet is much easier to find, the sorbet acts as ice without watering down the cocktail, and much less leftover sorbet. 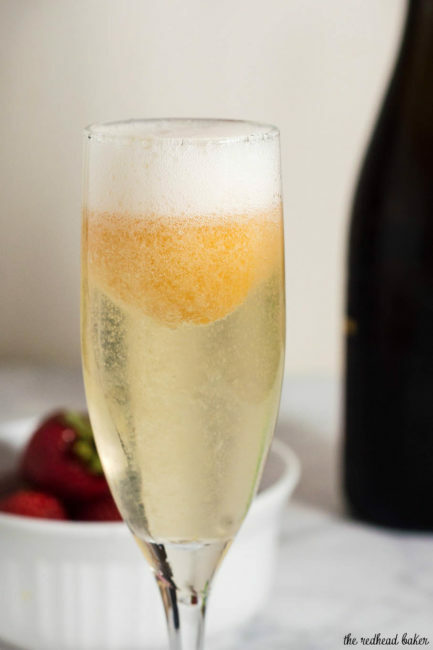 You don’t need to get top-shelf prosecco for this recipe, since it will be mixed with the sorbet, but it should still be something you’d enjoy drinking straight. I chose one with citrusy-notes to complement the flavor of the sorbet. The recipe notes that this will yield 6 cocktails, but that’s because there are about 6 servings in a bottle of prosecco. You definitely won’t use up all of the sorbet, so if you want to make more than six cocktails, you’ll need a second bottle of wine, but one pint of sorbet should still be more than enough. If you’re like me, and you’re only making mango sorbet bellinis for two people, you might end up with leftover prosecco. Supposedly (I haven’t tried this), you can dangle a spoon, handle-end down, in a bottle of sparkling wine and it will preserve the sparkle (bubbles) as you store it in the refrigerator. But if yours does go flat, there are still things you can do with it rather than pour it out. You can use it in just about any recipe that calls for white wine, and you can even use it in homemade beauty products such as face toner and hair rinses. 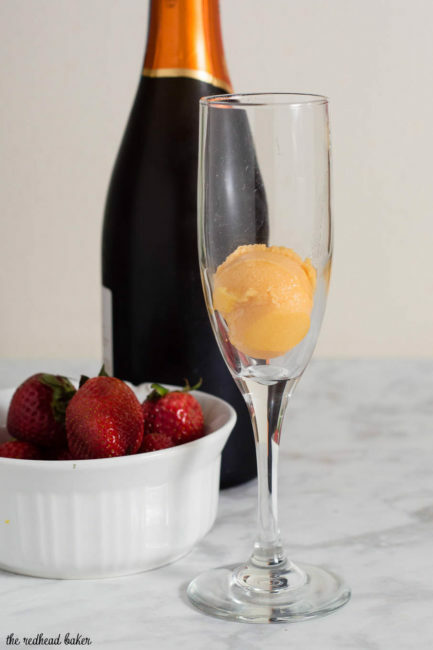 Scoop a spoonful (about two tablespoons) of sorbet into each of 6 chilled champagne flutes. 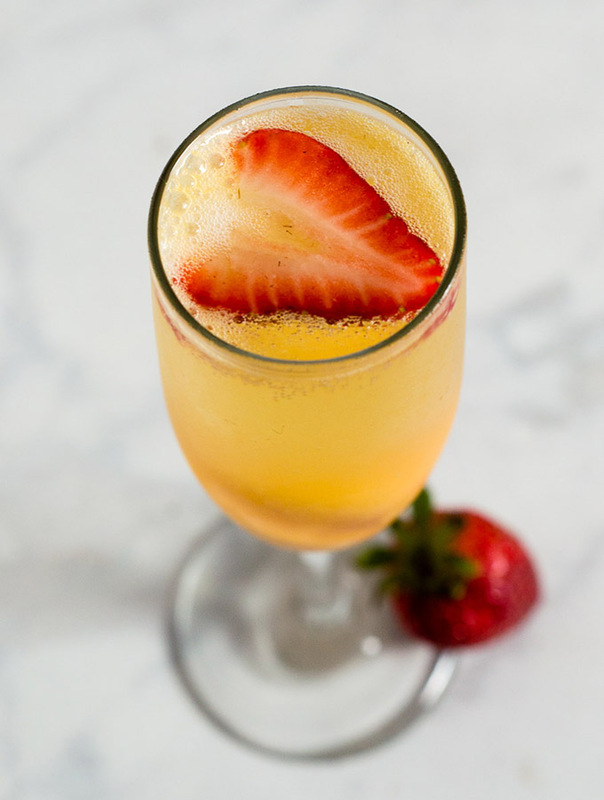 Top each glass off with chilled prosecco. Garnish with a fresh strawberry slice and serve. I’ve seen this idea before but never actually tried it. 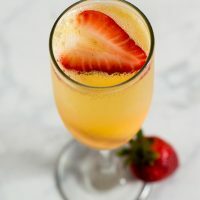 It’s such a great and easy way to make a bellini at home! I’ve been wanting to try something similar with sorbet. Now, I’m inspired! These sound delicious.